Orenthal James "O. J." Simpson , nicknamed "The Juice", is a retired American collegiate and professional football player, football broadcaster, and actor. Originally attaining a public profile in sports as a running back at the collegiate and professional levels, Simpson was the American Football League's Buffalo Bills' first overall pick in the 1969 Common Draft, and the first professional football player to rush for more than 2,000 yards in a season, a mark he set during the 1973 season. While five other players have passed the 2,000 rush yard mark he stands alone as the only player to ever rush for more than 2,000 yards in a 14-game season (professional football changed to a 16-game season in 1978). He also holds the record for the single season yards-per-game average which stands at 143.1 ypg. Simpson was elected to the Pro Football Hall of Fame in 1985. He also had successful careers in acting and sports commentary. Simpson gained 11,236 rushing yards, placing him 2nd on the NFL's all-time rushing list; he now stands at 17th. He was named NFL Player of the Year in 1973, and played in six Pro Bowls. He was the only player in NFL history to rush for over 2,000 yards in a 14 game season and he's the only player to rush for over 200 yards in six different games in his career. Simpson was inducted into the Pro Football Hall of Fame in 1985, his first year of eligibility. Simpson acquired the nickname "Juice" as a play on "O. J. ", an informal abbreviation for "Orange Juice". "Juice" is also a colloquial synonym for electricity or electrical power, and hence a metaphor for any powerful entity; the Bills' offensive line at Simpson's peak was nicknamed "The Electric Company." Even before his retirement from football and in the NFL, Simpson embarked on a successful film career with parts in films such as the television mini-series Roots, and the dramatic motion pictures The Cassandra Crossing, Capricorn One, The Klansman, The Towering Inferno, and the comedic Back to the Beach and The Naked Gun trilogy. In 1979, he started his own film production company, Orenthal Productions, which dealt mostly in made-for-TV fare such as the family-oriented Goldie and the Boxer films with Melissa Michaelsen and Cocaine and Blue Eyes, the pilot for a proposed detective series on NBC. NBC was considering whether to air Frogmen, another series starring Simpson, when his arrest canceled the project. On June 24, 1967, Simpson married Marguerite L. Whitley. Together they had three children: Arnelle L. Simpson (born December 4, 1968), Jason L. Simpson (born April 21, 1970) and Aaren Lashone Simpson (born September 24, 1977). In August 1979, Aaren drowned in the family's swimming pool a month before her second birthday.Simpson and Whitley were also divorced that same year. On February 2, 1985, Simpson married Nicole Brown. They had two children, Sydney Brooke Simpson (born October 17, 1985) and Justin Ryan Simpson (born August 6, 1988), and were divorced in 1992. In 1995, Simpson was acquitted of the murder of Nicole Brown Simpson and Ronald Goldman after a lengthy, internationally publicized criminal trial – the People v. Simpson. A 1997 judgment against Simpson for their wrongful deaths was awarded in civil court, and to date he has paid little of the $33.5 million judgment. His book, If I Did It (2006), which purports to be a first-person fictional account of the murders had he actually committed them, was withdrawn by the publisher just before its release. The book was later released by the Goldman family. 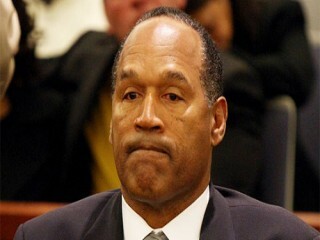 In September 2007, Simpson was arrested in Las Vegas, Nevada, and charged with numerous felonies, including armed robbery and kidnapping. In 2008, he was found guilty and sentenced to 33 years imprisonment, with a minimum of 9 years without parole. He is currently serving his sentence at the Lovelock Correctional Center in Lovelock, Nevada.